The Red Squirrel Chasers are a string band made up of four friends with diverse musical influences and interests that seamlessly merge into a new, but familiar sound. They had been playing dances together for nearly ten years when they decided to focus on their shared interest in the musical terrritory that occupies that fuzzy musical boundary between the old-time bands of the 1920s and the bluegrass sounds that emerged in the 1940s. The results are spare melody lines, blended instrumental textures and a streamlined sound. 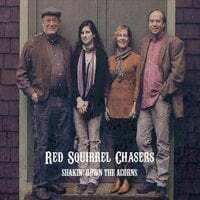 Together the Red Squirrel Chasers combine red hot fiddling, tight harmony singing, great material and a powerful band sound that skips along and soars effortlessly. Stephanie Coleman (fiddle, vocals) was first exposed to old-time music through her father, a fiddler himself. At nine years old, she picked up a fiddle and played a shrill yet nearly recognizable rendition of “Johnny Don’t Get Drunk”. She proceeded to immerse herself in Appalachian and Midwestern styles of old-time fiddling, plunging into both the craft and the rich history behind the music. Stephanie has performed and taught at festivals, workshops, and dances throughout the United States, Europe, and Australia and remains a regular finalist in the renowned fiddle contest at the Appalachian String Band Festival in Clifftop, West Virginia. In 2009, Stephanie toured Europe, Australia, and the States with Uncle Earl, an internationally known all-girl string band. Her fiddling can be also heard on clawhammer banjo master Adam Hurt’s celebrated recording Perspective, as part of a traditional fiddle duo with Cleek Schrey and most recently, on Kristin Andreassen's new CD, "Gondolier." Jim Collier (mandolin, vocals) has been playing old-time and bluegrass music on banjo, fiddle, guitar, autoharp and mandolin since his high school days in Raleigh, N.C. Influenced early on by Roscoe Holcomb, Virgil Anderson, Clyde and Ralph Troxel, and Gaither Carlton, all of whom he paid visits to, Jim developed an interest in a variety of non-commercial old-time music. While living in Boone, NC, Jim had the good fortune to have spent several of his formative musical years playing and spending time with Arnold Watson and getting to experience the rich musical legacy of the Watson family. With the Red Squirrel Chasers, Jim continues to explore traditional styles of playing mandolin and the brother duet singing styles of the 1930s and 40s. Jim was a founding member of the Tarheel Hot Shots and the acclaimed old time and bluegrass fusion band Big Medicine, the Rye Mountain Boys, and of course, the Red Squirrel Chasers. He continues to play the banjo, fiddle, mandolin and guitar with his Raleigh-based band The Piney Woods Boys. Jim Nelson (guitar, vocals) is a veteran of the old-time music scene, having honed his skills through many years of playing with older dance fiddlers, including Bob Holt of Ava, Missouri and Lotus Dickey of Paoli, Indiana. He played with the St. Louis-based Ill-Mo Boys for over two decades, and also with the Volo Bogtrotters from 1985 to 1991 and again when they reunited in 2011. In addition to the Ill-Mo Boys and the Bogtrotters, he has made critically acclaimed recordings with fiddlers Rhys Jones, Chirps Smith, and Geoff Seitz. Jim has taught classes and numerous workshops on old-time back-up guitar at music camps and festivals across the country. When not performing with the Red Squirrel Chasers, he travels the Midwest and Upper South playing with several old-time dance bands, including the Hoosier Crackerjacks, the Little Egypt Pep-Steppers, and the Wabash Valley Cannonballs. Dedo Norris (bass, vocals) is well known and highly respected throughout the old-time American music world for her driving, rock steady rhythm which underlays the other instruments of the band. While having a wide range of musical talents including old-time fiddle, guitar, and Cape Breton and Irish back-up piano, the bass is her primary instrument in old-time bands. She taught herself to play bass in both bluegrass and old-time music styles, and it was all downhill from there. She spent a lot of time in her young adult life absorbing the music of Galax, Virginia and the Round Peak area near Mount Airy, North Carolina which remains her lifelong love. She has performed with numerous fiddlers and bands including Bruce Molsky, Rafe Stefanini, Brad Leftwich, Judy Hyman, Skip Gorman, Chirps Smith, Wabash Valley Cannonballs, Little Egypt Pep Steppers, The Hoosier Crackerjacks, and many more.